2. TRANSITIONS - Start with Windows Movie Maker. Its a GREAT program to start with ... dont go on what ppl say about WMM being stupid . Even I use WMM for ALL my transition .. Sony Vegas only for final finishing touches. Use WMM as much as u can .. get comfortable with it .. experiment with various transitions and animation . The trick is .. not to overdo it. Too much of anything is bad. Same goes for transitions and animation. When u pick a transition (Called "Animations" in WMM ), go for smoother transitions like Fade ins or Crossfade . If you go for Animations like the once that breaks ur video into a thousand tiny hearts/circles/triangle etc it makes the VM look childish and takes away from the feel of the video. When u have mastered WMM, download SOny Vegas and use it for colouring ur VMs and othe special effects. 3. VM PLOT AND SCENE SELECTION - The best VMs are not the ones with the fancy colouring / Flashy editing. Its the one with the best storyline. EVERY VM should tell its own story, and not borrow from the existing plot of the drama. So be very specific when you pick songs and select scenes for the. Sweet eyelocks and dance sequences are always a VM makers first preference because they are romantic by default but remeber its the tiny gestures, the inconspicuous changes in facial expression that make for the real feel of the video and give it the fine-tuning .And dont force scenes into your Vm .. if u feel it doesnt quite belong ... then it prolly doesnt . So be VERY specific about scene selection . Pick scenes that go with the lyrics even if it seems unromantic to u ... As long as it fits with the lyrics, the music will automatically take make the viewer with the flow of the song and not just random scenes because they look romantic... That way .. even if u dont have fancy editing , ppl will like ur VM and relate to it . Only when ur VM manages to tell a good story , the viewer go like "DAMN that was something. I could watch that a zillion times and not get bored". And the best way to know if ur viewer is gonna be "WOW-ed" is if u urself like it ! ---> For a hip, stylish and sizzling with chemistry couple like KriYaansh, use flash / Glow effects ... bright colours but not like the above category ... A blurred / White based Vignette brings out the chemistry of KriYansh ! 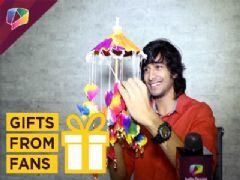 ---> SwaRon is a more ... uh how do I say this .. If KriYansh is like the turbulent waters of the Niagra Falls .. with Extreme highs and lows and hots and chills ... SwaRon would be like the calm surface of a lake running thru a deep ravine between two mountains ... U should use (in my opinion) slightly darker colours and a muted glow for them ... Usually a black based Vignette ( The black shading around the border) for SwaRon as opposed to the white vignette for Kriyansh ..
ALL THAT BEING SAID .. All the best to my newbies Looking forward to your VMs ! Dil mein iss the my .. laddoo is the phootings .. itne saare phootings ... ke soching dukaan kholing yaa not ?